It's somewhere between 7 am and 9 am on a weekday. Crowds of people pour out of Central Station. While some disperse along the way, others continue through Anzac Square, across the road to Post Office Square, through the GPO arcade, then through the grounds of St Stephen's Cathedral to enter the massive office towers along the Brisbane River and through the city. The whole process is reversed into a mass exodus between 5pm and 7pm in the evening. I was part of this human ebb and flow myself for more years than I care to remember - the tidal flow of Brisbane commerce; the human resource that powers big business. 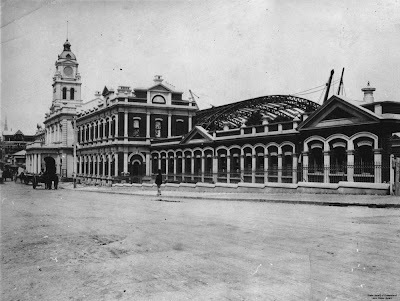 The original Central Station was constructed from wood and galvanised iron, but after the tunnel through to Brunswick Street was completed, the station was rebuilt in 1899 from a design by architect JJ Clark "with arches of corrugated galvanised iron over the platforms and a portico on Ann Street". This is the way it looked in 1901 (photo above). You may also enjoy this postcard from 1904 that shows a night-view of the station, complete with a beautiful moon. Central Station was incorporated into the Sheraton Hotel (now the Hotel Sofitel) building during its construction in the early 1980s. and, as a result, it has been significantly altered. This is the way it looks now (below) - click on the photo to see a larger image.